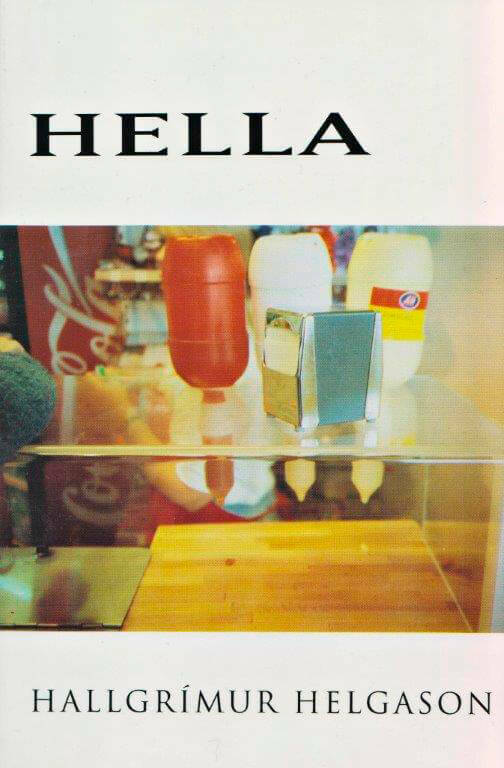 Hallgrímur Helgason’s first novel, Hella, was published in 1990, a visual and cinematic story that takes place in the small village of Hella, situated in southern Iceland, an agricultural county surrounded by the volcanoes Mt. Hekla and Eyjafjallajökull and famous for its big earthquakes. Helgason aims for a totally objective tone, tries to stay away from poetic descriptions and the use of adjectives. The text never enters the mind or the feelings of the characters, describing everything from the outside. It’s an attempt at letting the inner world be read through the signs of the outer visual world. Inspired by Flaubert’s Madame Bovary as well as Duchamp’s Large Glass, the book tells the story of one summer in the life of a 14-year-old girl who gets her first job at the highway diner and has her first sexual encounter in a tent at the local horse fair. The latter coincides with a small earthquake shaking the area. The novel can be read as one big metaphor for the transition from virgin to woman. It was met with lukewarm reception—at most the critics said the book was interesting—and sales were modest.